8000 Feet and Counting: What is Justice? 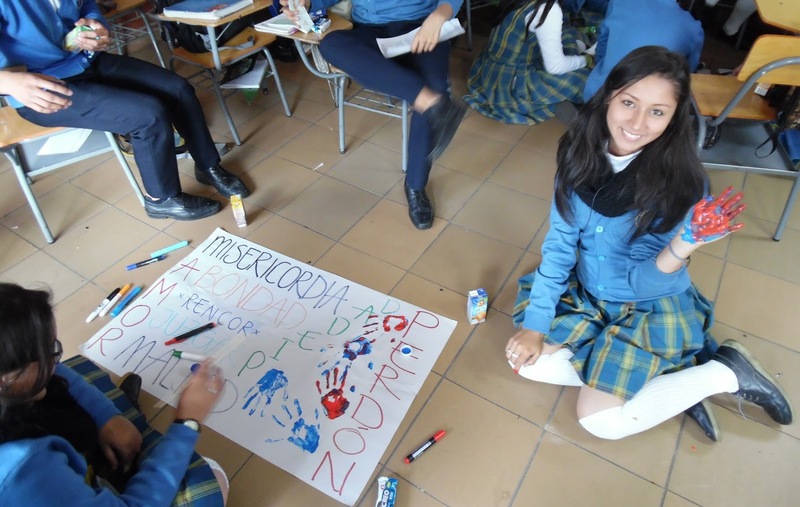 Recently, all tenth graders from the Saint Luke’s Lutheran School, in southern Bogota, were taken on a field trip to visit a prison in Bogota. The prison, “La Modelo”, is infamous for horrendous treatment of prisoners; here is a documentary for anyone interested. The school then invited the Human Rights Program of the Lutheran Church, to spend some time talking with the students, helping them unpack what they witnessed during their visit. We focused on themes of justice; that there are many different ideas of what constitutes justice. We had some great conversations with the students, beginning by asking if what they saw during their visit was in fact justice, as the prison is part of the “Justice System”. The discussion then went to compare justice as defined by humans with God’s justice. The students had a great time drawing/painting their thoughts on these issues. Curtis helping the groups of 10th graders discuss "justice". Photo by Sara Lara. Students of the 10th grade with their artful reflection, including justice as love, grace, forgiveness. Photo by Curtis Kline. 10th grade students artfully reflecting on their experience. Photo by Curtis Kline.